Come join us for a lively roundtable discussion! We will cover the basics of cash balance plans for professional firms from the perspective of both participants and plan sponsors. Topics to be covered will include an introduction to market rate cash balance plans, design considerations, deductions, nondiscrimination testing, 415 limits, and top-25 issues. The discussion will cover the basics as well as get into detail for more sophisticated questions. Dan Jaffe, Janelle Ong, and Julie Sachs, all actuaries with Altman & Cronin, will lead our discussion. Dan Jaffe is an Enrolled Actuary with over 25 years of experience consulting on retirement plan issues to private-sector defined benefit plan sponsors. Dan’s areas of focus include compliance, administration, nondiscrimination, particularly in connection with cash balance plans. Janelle Ong is a Fellow of the Society of Actuaries and an Enrolled Actuary. She has over 14 years of experience in retirement consulting that has encompassed valuation, financial accounting, compliance, plan design and administration of qualified and non-qualified defined benefit plans and post-retirement medical plans. She has been working on law firm cash balance plans at A&C since 2010. Julie Sachs is a Fellow of the Society of Actuaries and an Enrolled Actuary with over 14 years of actuarial experience in the retirement area. She consults to both large and small employers on a variety of actuarial topics and has extensive expertise in pension risk management, retirement plan design, valuation, financial consulting, and administration. Julie is a Phi Beta Kappa graduate from the University of Michigan and earned a degree with high honors in mathematics. Deadline to register: Tuesday, April 23, 2019 or until all seats are full. 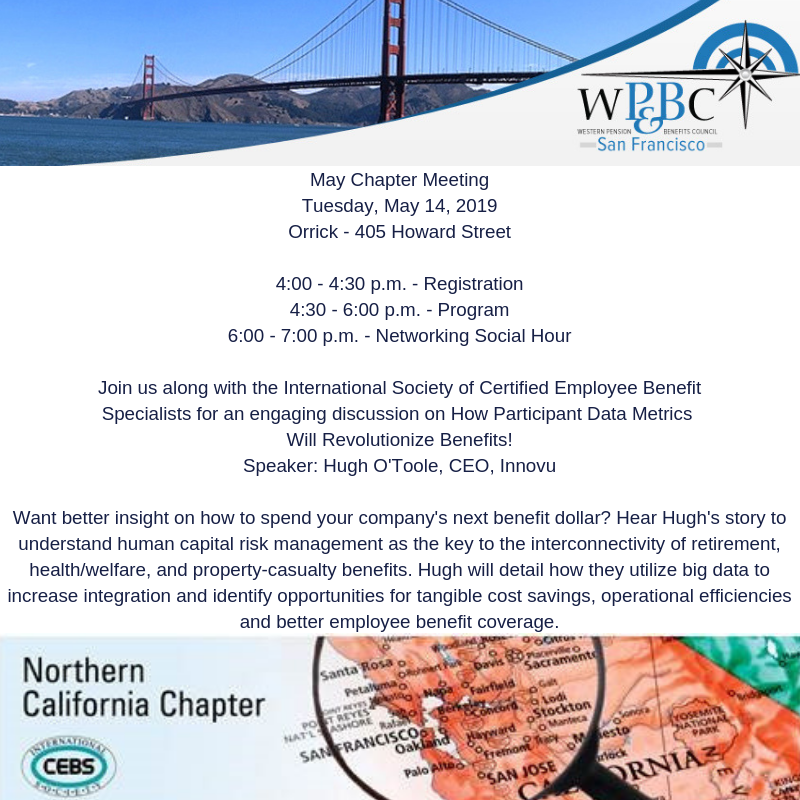 WP&BC San Francisco Chapter Meeting - How Participant Data Metrics Will Revolutionize Benefits! REGISTER EARLY - The cost for this special event is $45 for WP&BC Members, $75 for Non-members. No refunds after May 5, 2019, but substitutions are permitted at any time. registration is required - email names to info@wpbcsf.org. CEUs for this event are available for Attorneys, CPAs and Actuaries. WEBSITE - your credit card number is secure (or you can register and send in a payment by check). Join us for a a panel discussion on Creative Benefits Communication Strategies. A panel of Plan Sponsors will discuss how they communicate benefit changes to their employees. For the 2018-2019 fiscal year! Join other pension and benefits professionals in the San Francisco Bay Area who have realized the benefits of this unique, multidisciplinary organization. Learn how membership can benefit you HERE! a new annual conference partnership for 2018! The Western Pension & Benefits Council was founded in 1954 in San Francisco to bring together all professionals involved in pension and other employee benefits work to promote education, exchange information, and foster sound principles and practices in the field. Chapter members are plan sponsors and professionals from the accounting, actuarial, administrative, banking, consulting, investment, insurance and legal areas of the industry. Our membership reflects a cross-section of professionals from professional service firms and corporations. It is our goal to bring these disciplines together to better understand and produce effective employee benefit programs.